Morton?s neuroma is inflammation, thickening, or enlargement of the nerve between the bones of the toes (metatarsal bones). The condition is also called intermetatarsal neuroma. The thickening is usually found between bones of the third and fourth toes of the foot, but sometimes it may develop between the second and third toes. It occurs when the medial plantar nerve near the bones of those toes becomes compressed or irritated, possibly because the metatarsal bones press against the nerve in the narrow gap between the toes. If left untreated, Morton?s neuroma can cause a sharp, burning, or shooting pain that often gets worse over time. The pain becomes worse when a person walks or stands on the ball of the foot. Sometimes the pain reaches the toes next to the neuroma and a sensation of tingling or numbness is felt. The cause of this problem is often due to impingement of the plantar nerve fibres between the metatarsal heads and the intermetatarsal ligament. It is entirely a biomechanical phenomenon. Differential diagnoses include stress fracture, capsulitis, bursitis or ligament injury at the metatarsal-phalangeal joint, a tendon sheath ganglion, foreign-body reaction and nerve-sheath tumour. Patients will complain of numbness, a ?pins and needles? type of tingling and loss of sensation in the toes. Burning pain in the ball of the foot that may radiate into the toes. The pain generally intensifies with activity or wearing shoes. Night pain is rare. There may also be numbness in the toes, or an unpleasant feeling in the toes. Runners may feel pain as they push off from the starting block. High-heeled shoes, which put the foot in a similar position to the push-off, can also aggravate the condition. Tight, narrow shoes also aggravate this condition by compressing the toe bones and pinching the nerve. Your podiatric physician will begin by taking a history of your problem. Assist him or her by describing your condition as well as you can. Keep track of when the symptoms started and how, any changes you?ve noted (whether the pain has gotten worse, or whether other symptoms have appeared as well, etc.). If you?ve noticed that certain activities or footwear make things worse or bring about additional symptoms, be sure to mention that. If you work in specific footwear, or if you participate in any certain sports, bring the shoes you use. Your doctor may be able to learn quite a lot about your condition that way! Most non-operative treatment is usually successful, although it can take a while to figure out what combination of non-operative treatment works best for each individual patient. Non-operative treatment may include the use of comfort shoe wear. The use of a metatarsal pad to decrease the load through the involved area of the plantar forefoot. A period of activity modification to decrease or eliminate activities, which maybe exacerbating the patient?s symptoms. For example, avoiding long periods of standing or other activities that result in significant repetitive loading to the forefoot can be very helpful. Wearing high heels should be avoided. Local corticosteroid injections can help decrease inflammation associated with the nerve. However, this does not necessarily address the underlying loading forces that maybe causing the injury to the nerve in the first place. It has been proposed that an alcohol injection in and around the nerve will cause a controlled death to the nerve and subsequently eliminate symptoms from the nerve. In theory, this may be helpful. In practice, adequate prospective studies have not demonstrated the benefit of this procedure above and beyond the other standard non-operative treatments available. In addition there is the concern that the alcohol will cause excessive scarring and death of other important structures in the area. The ultimate success of a Morton?s neuroma treated surgically can be variable. In cases where the underlying problem is only an irritated nerve (a true Morton?s neuroma), then surgery will probably be curative (although it may take a few months for the foot to fully heal). But in many cases, forefoot pain is more complex. There may be an irritated nerve or two causing pain, but the real problem is often excessive loading of the lesser metatarsals. The generic term for this condition is metatarsalgia. When considering surgery, identifying and addressing these problems may lead to a better end result. Fctors that increase the risk of developing heel spurs include a high body mass index (BMI), regular vigorous activity, and intensive training routines or sports. Factors such as these are believed to increase the incidence of repetitive stress injuries that are associated with the formation of heel spurs. When a heel spur forms, extremely sharp pain along with the feeling that a part of the heel is trying to burst through the skin usually occurs. If left untreated, an individual may eventually begin to struggle to perform simple activities such as walking. Most people think that a bone “spur” is sharp and produces pain by pressing on tissue, when in fact, these bony growths are usually smooth and flat. Although they rarely cause pain on their own, bone spurs in the feet can lead to callus formation as tissue builds up to provide added cushion over the area of stress. Over time, wear and tear on joints may cause these spurs to compress neighboring ligaments, tendons or nerves, thus injuring tissue and causing swelling, pain and tearing. Sharp pain localized to the heel may be all a doctor needs to understand in order to diagnose the presence of heel spurs. However, you may also be sent to a radiologist for X-rays to confirm the presence of heel spurs. There are many ways to treat heel spurs. Some remedies you can even do at home once a podiatrist shows you how. 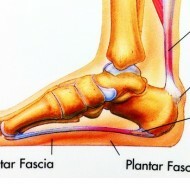 Heel spur treatment is very similar to treatment of plantar fasciitis. Here are a few of the most common treatments. First, your doctor will assess which activities are causing your symptoms and suggest rest and time off from these activities. Ice packs are used to control pain and reduce symptoms. Certain exercises and stretches help you to feel relief quickly. Medications that reduce inflammation and decrease pain are also used. Sometimes cortisone injections are given. Often special shoe orthotics can help to take the pressure off of the plantar fascia and reduce symptoms. Night splints that keep your heel stretched are sometimes recommended. Rarely, surgery is an option. A new treatment called extracorporeal shock wave therapy is being studied. A heel spur (or osteophyte) is a small bony growth or collection of bony growths on the back or underside of the heel. They may or may not cause pain, and patients often confuse heel spurs with a related condition known as plantar fasciitis, inflammation of the band of tissue that stretches from the ball of the foot to the heel, forming the arch. Many people have bone spurs without ever knowing it, and about 70 percent of patients with plantar fasciitis who do have discomfort will also be found to have a heel spur when observed via X-ray. It is likely that a bone spur forms as the body tries to repair itself from repeated injury by laying down extra bone at the site of trauma. Plantar fasciitis is typically another result of such trauma. Heel spurs are most often seen in middle-aged men and women, but can be found in all age groups. Heel spurs often do not show any symptoms. If you have intermittent or chronic pain when you walk, run or jog, it may be heel spur. There will be inflammation the point where spur formation happens. The pain is caused by soft tissue injury in the heel. Patients often describe the pain as a pin or knife sticking to the heel. The pain is more specially in the morning when the patient stands up for the first time. A Diagnosis of Heel Spur Syndrome is a very common reason for having heel pain. Heel pain may be due to other types of conditions such as tendonitis, Haglund’s Deformity, Stress Fracture, Tarsal Tunnel Syndrome, or low back problems. A more common condition in children is Sever’s Disease. The diagnosis is usually made with a combination of x-ray examination and symptoms. If pain and other symptoms of inflammation-redness, swelling, heat-persist, you should limit normal daily activities and contact a doctor of podiatric medicine. The podiatric physician will examine the area and may perform diagnostic X-rays to rule out problems of the bone. Early treatment might involve oral or injectable anti-inflammatory medication, exercise and shoe recommendations, taping or strapping, or use of shoe inserts or orthotic devices. Taping or strapping supports the foot, placing stressed muscles and tendons in a physiologically restful state. Physical therapy may be used in conjunction with such treatments. A functional orthotic device may be prescribed for correcting biomechanical imbalance, controlling excessive pronation, and supporting of the ligaments and tendons attaching to the heel bone. It will effectively treat the majority of heel and arch pain without the need for surgery. Only a relatively few cases of heel pain require more advanced treatments or surgery. If surgery is necessary, it may involve the release of the plantar fascia, removal of a spur, removal of a bursa, or removal of a neuroma or other soft-tissue growth. Most studies indicate that 95% of those afflicted with heel spurs are able to relieve their heel pain with nonsurgical treatments. If you are one of the few people whose symptoms don?t improve with other treatments, your doctor may recommend plantar fascia release surgery. Plantar fascia release involves cutting part of the plantar fascia ligament in order to release the tension and relieve the inflammation of the ligament. Sometimes the bone spur is also removed, if there is a large spur (remember that the bone spur is rarely a cause of pain. Overall, the success rate of surgical release is 70 to 90 percent in patients with heel spurs. One should always be sure to understand all the risks associated with any surgery they are considering. There are two main bursae involved in heel bursitis, the subtendinous calcaneal bursa and the subcutaneous calcaneal bursa. Both of these bursa are located near the Achilles tendon. The subtendinous calcaneal bursa, which is also referred to as the retrocalcaneal bursa, is on the back of the heel and is deeply situated between the Achilles tendon and the calcaneus. The subcutaneous calcaneal bursa, which is commonly referred to as the Achilles bursa, is located near the bottom of the heel between the skin and the distal aspect of the Achilles tendon. It?s much more superficial to the Achilles tendon than the subtendinous calcaneal bursa. Repetitive overuse injury of the ankle during long periods of running and or walking. Tight shoes. The heel counter of the shoe constantly rubbing against the back of the heel. Wearing shoes with a low cut heel counter. Abnormal foot mechanics (abnormal pronation). Poor flexibility. Inappropriate training. Nagging ache and swelling in or around a joint. Painful and restricted movement in the affected joint. Pain radiating into the neck or arms when bursitis strikes the shoulder (the most common site). Fever, when associated with an infection. For non-infectious bursitis, the preliminary treatment starts with non-operative options such as cold compression therapy and Blood Flow Stimulation Therapy. Surgery to remove the inflamed bursa is normally not required for bursitis, however if you fail to see improvement with the conservative treatments, your physician may recommend surgery to remove the bursa completely. Although this removes the problem of an inflamed bursa, you are left with less cushioning in your joint which can lead to a host of other conditions. Prevention can be accomplished by controlling your foot structure with good supportive shoes or arch supports. Pay attention to early signs of friction like blister formation. This tells you where the areas that are more likely to cause a bursa to form and subsequently a bursitis. A hammertoe is a toe that becomes permanently bent in the middle so that the end of the toe points downward. The portion of the toe before the joint where the bend occurs tends to arch upward. A hammer toe takes years to develop. Once the toe becomes permanently bent, corns or calluses may form. Treatment helps control symptoms in many people, but surgery is sometimes needed to straighten the toe. The cause of hammertoes varies, but causes include genetics, arthritis and injury to the toe. Treatment for hammertoes depends on the severity and can include anti-inflammatory medication, metatarsal pads, foot exercises and better-fitting shoes. If the pain caused by a hammertoe is so severe that wearing a Hammer toe shoe is uncomfortable, surgery may be necessary. Typically this surgery is an outpatient procedure that doesn?t require general anesthesia, though it is an option. Recovery from surgery usually takes a few weeks, and patients are given special shoes to wear. Your podiatrist may recommend one or more of these treatments to manage your hammer toes. Wear shoes with roomy toe boxes which don?t force your toes together. Exercises to stretch and strengthen muscles in the toes. Over the counter toe straps, cushions, and corn pads. Custom orthotic inserts. Toe caps or toe slings. In severe cases, surgery to release the muscles in the affected toes. Surgery is the approach that is often necessary to correct hammertoe that fails to respond to nonsurgical management. Surgery is appropriate when the muscles and tendons involved in a hammertoe problem have become so tight that the joints are rigid, misaligned and unmovable. There are a number of surgical techniques for dealing with the complex range of joint, bone, muscle, tendon and ligament abnormalities that define each hammertoe’s make-up. To correct a hammertoe deformity, the surgeon’s goal is to restore the normal alignment of the toe joint, relieving the pressure that led to the hammertoe’s development (this should also relieve the pain, as well). To do this, he or she may remove part of the boney structure that creates a prominence at the top of the joint. Tighten or loosen the muscles, tendons and ligaments around the toe joints. Realign the toe bones by cutting one or more and shifting their position, realigning muscles, tendons and ligaments accordingly. Use screws, wires or plates to hold the joint surfaces together until they heal. Reconstruct a badly damaged joint or replace it with an artificial implant. elect and wear the right shoe for specific activities (such as running shoes for running). Alternate shoes. Don’t wear the same pair of shoes every day. Avoid walking barefoot, which increases the risk for injury and infection. At the beach or when wearing sandals, always use sunblock on your feet, as you would on the rest of your body. Be cautious when using home remedies for foot ailments. Self-treatment can often turn a minor problem into a major one. It is critical that people with diabetes see a podiatric physician at least once a year for a checkup. People with diabetes, poor circulation, or heart problems should not treat their own feet, including toenails, because they are more prone to infection. A bunion is a growth of skin at the joint of the big toe, often a result of enlarged tissue or misaligned bone. In some cases, the bunion may be so extreme that it pushes the big toe inward toward the second toe. Skin and tissue surrounding the joint may experience sensitivity to touch, tenderness and pain. The main cause of bunions is excessive pressure being placed on the front of the foot, and is usually the result of wearing high-heeled shoes with pointed toes. A study by the American Orthopaedic Foot and Ankle Society found that 88 percent of women in the United States wear shoes that are too small and that 55 percent of them have bunions. Overall, bunions are nine times more common in women than men. In some cases, bunions are hereditary; they also may be caused by arthritis or polio. SymptomsJust because you have a bunion does not mean you will necessarily have pain. There are some people with very severe bunions and no pain and people with mild bunions and a lot of pain. Symptoms for a bunion may include pain on the inside of your foot at the big toe joint, swelling on the inside of your foot at the big toe joint, appearance of a “bump” on the inside edge of your foot. The big toe rolling over to one side. Redness on the inside of your foot at the big toe joint. Numbness or burning in the big toe (hallux). Decreased motion at the big toe joint. Painful bursa (fluid-filled sac) on the inside of your foot at the big toe joint. Pain while wearing shoes – especially shoes too narrow or with high heels. Joint pain during activities. Other conditions which may appear with bunions include Corns in between the big toe and second toe. Callous formation on the side or bottom of the big toe or big toe joint. Callous under the second toe joint. Pain in the second toe joint. Diagnosis begins with a careful history and physical examination by your doctor. This will usually include a discussion about shoe wear and the importance of shoes in the development and treatment of the condition. X-rays will probably be suggested. This allows your doctor to measure several important angles made by the bones of the feet to help determine the appropriate treatment. Apply special pads and dressings to protect the bunion from shoe pressure. Inject steroid and local anesthetic around the bunion to reduce inflammation. This is especially useful if there is an associated bursitis. Recommend commercially available or custom made shoes. Prescribe functional orthotics to correct faulty foot function, and help prevent worsening of the deformity. Recommend bunion surgery to correct the deformity. If all nonsurgical measures fail to control the symptoms, then surgery may be suggested to treat the hallux valgus condition. Well over 100 surgical procedures exist to treat hallux valgus. 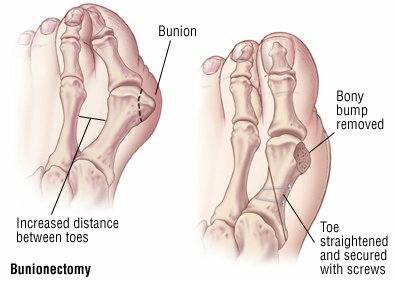 The basic considerations in performing any surgical procedure for hallux valgus are to remove the bunion, to realign the bones that make up the big toe, to balance the muscles around the joint so the deformity does not return. There are some steps that may help prevent, or at least slow, the progression of bunions. Avoid shoes with a narrow toe box. If your foot flattens excessively, make sure you wear supportive shoes, and if necessary, get custom orthotics from your podiatrist. See your podiatrist at the first signs or symptoms of a bunion deformity, as early treatment may stop or slow its progression. Simply put, over-pronation is an excessive or poorly timed pronation which is part of the regular stride. Pronation is when the foot rolls inwards and the arch compresses as part of your normal walking motion. 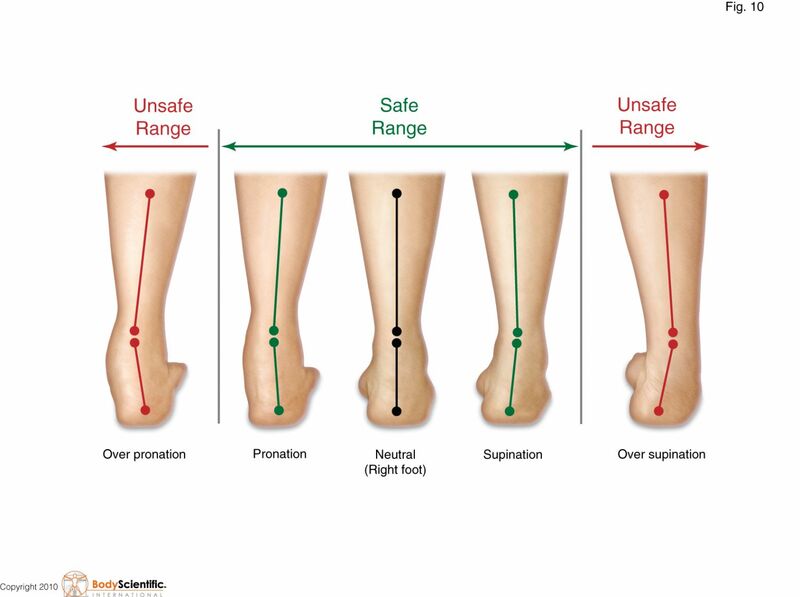 Pronation is necessary for shock absorption to transmit forces up and down our legs. 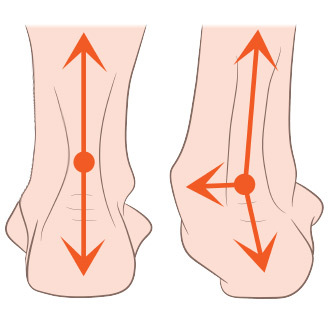 When someone over-pronates, the foot rolls inwards to a greater degree and the arch flattens: this causes the knee and hip to come out of alignment and reduces the function of all the bones in the feet. In adults, the most common reason for the onset of Over-Pronation is a condition known as Post Tibial Tendonitis. This condition develops from repetitive stress on the main supporting tendon (Posterior Tibial Tendon) of the foot arch. As the body ages, ligaments and muscles can weaken. When this occurs the job of providing the majority of the support required by the foot arch is placed upon this tendon. Unfortunately, this tendon cannot bear the weight of this burden for too long. Eventually it fatigues under the added strain and in doing so the foot arch becomes progressively lower over a period of time. When standing, your heels lean inward. When standing, one or both of your knee caps turn inward. Conditions such as a flat feet or bunions may occur. You develop knee pain when you are active or involved in athletics. The knee pain slowly goes away when you rest. You abnormally wear out the soles and heels of your shoes very quickly. Heel counters that make the heel of the shoe stronger to help resist/reduce excessive rearfoot motions. The heel counter is the hard piece in the back of the shoe that controls the foot?s motion from side-to-side. You can quickly test the effectiveness of a shoe?s heel counter by placing the shoe in the palm of your hand and putting your thumb in the mid-portion of the heel, trying to bend the back of the shoe. A heel counter that does not bend very much will provide superior motion control. Appropriate midsole density, the firmer the density, the more it will resist motion (important for a foot that overpronates or is pes planus), and the softer the density, the more it will shock absorb (important for a cavus foot with poor shock absorption) Wide base of support through the midfoot, to provide more support under a foot that is overpronated or the middle of the foot is collapsed inward. Wear supportive shoes. If we’re talking runners you’re going to fall in the camp of needing ‘motion control’ shoes or shoes built for ‘moderate’ or ‘severe’ pronators. There are many good brands of shoes out there. Don’t just wear these running, the more often the better. Make slow changes. Sudden changes in your training will aggravate your feet more than typical. Make sure you slowly increase your running/walking distance, speed and even how often you go per week. Strengthen your feet. As part of your running/walking warm up or just as part of a nightly routine try a few simple exercises to strengthen your feet, start with just ten of each and slowly add more sets and intensity. Stand facing a mirror and practice raising your arch higher off the ground without lifting your toes. Sit with a towel under your feet, scrunch your toes and try to pull the towel in under your feet. Sitting again with feet on the ground lift your heels as high as you can, then raise and lower on to toe tips.